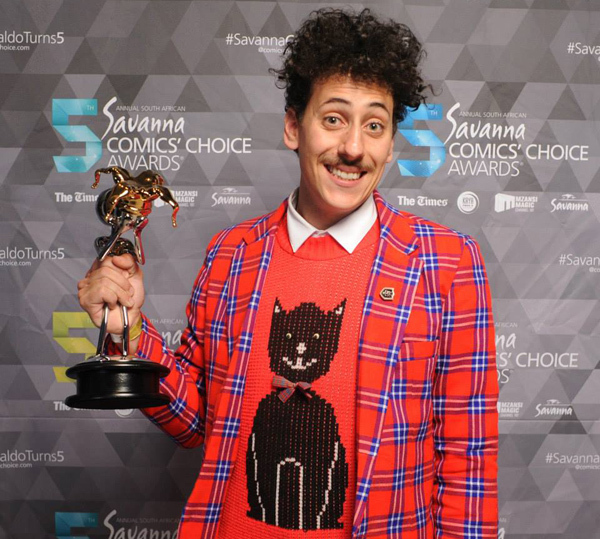 Savanna Newcomer Award winner (2013), Schalk Bezuidenhout, was born in the wonderful city of Johannesburg. Even though this sounds very contemporary, he grew up in a very Afrikaans, ‘bring-terug-Apartheid’ town next to the airport. The traditional Afrikaans way of living was a good life. Mamma’s breast milk would be brandewyn en coke, you would walk kaalvoet to school, and you’d hide your lunch money when a black man walked past. But life started to become difficult for poor Schalkie. He slowly evolved from an Afrikaans conservative caterpillar into a beautiful dramaqueen butterfly, complete with a moustache and furry afro. While studying in Cape Town he realised that there was more to life than boerewors and rugby. He quickly became conscious of the fact that he could still be a proud Afrikaans boy, whilst wearing skinny jeans. In just 3 years Schalk has made a lot of progress as a comedian. This year he won the The Intermediatete Comic Award. His mother wrote this. See Schalk in Pieter-Dirk EISH’s boeredrama musiekspel “Die Van Aardes Van Grootoor – The Musical” as John Firestone Jnr | Tertius at Theatre on the Bay from 09 Dec ’15 – 09 Jan ’16 and Montecasino Theatre from 15 Jan – 21 Feb ’16.